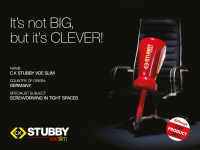 Leading provider of quality hand tools, C.K tools, is celebrating the success of its VDE Stubby Screwdriver range. In a 70,000+ reader poll conducted by Professional Electrician & Installer Magazine, the C.K VDE Stubby Screwdriver range was crowned as one of the best products of 2017. The awards recognise the manufacturers and suppliers of innovative products, tools or timesaving solutions, which help electricians to get the job done efficiently, safely and professionally. The C.K Stubby VDE Slim Screwdrivers feature a shorter length, making them ideal for use in confined spaces, and full VDE approval provides the assurance that each is individually tested to 10,000v for safe working up to 1,000v. Premium quality, chrome vanadium steel blades provide exceptional strength and durability while the slim shaft, allows access to recessed screws and fixings. Furthermore, anti-roll flats prevent the screwdriver from rolling off sloping surfaces. Manufactured in Germany, the C.K Stubby VDE Slim Screwdrivers are available in four key tip types, the essential PZ2, Slotted sizes 4.0mm and 5.5mm and Modulo (+/-) 2, with tip type markings for easy identification. Other industry-leading products launched by C.K tools this year include Europe’s first 100% splinterproof cable rods, the C.K MightyRod PRO, and the slim yet tough, C.K dextroVDE Slim Screwdrivers. For further information please call 01758 704704.